Our first topic this term was 'Dinosaurs' so all our learning was done through the theme of dinosaurs. You may have been aware of the story unfolding in our class. We were lucky enough to have a REAL DINOSAUR EGG on loan from Cardiff Museum. However, each morning the egg seems to have moved! First on the chair, then on the carpet and it rolled itself across the floor - almost to the door! The Dinosaur egg even ended up in the school kitchen and our cook almost used it to make scramble eggs- that would have been a disaster! Luckily the egg is microchipped and we have Mr. Buttler from Cardiff museum to speak to if we need advice. But who is responsible? Could it be Mr Bonesy? We have already used our creative skills during our very first week back when making bookmarks in line with our dinosaur topic- as we love reading here in the Elms Classroom. The children have also been learning all about Continents and Oceans - please ask your child to sing the 'oceans song' we have been practicing this in class - it is so much fun! 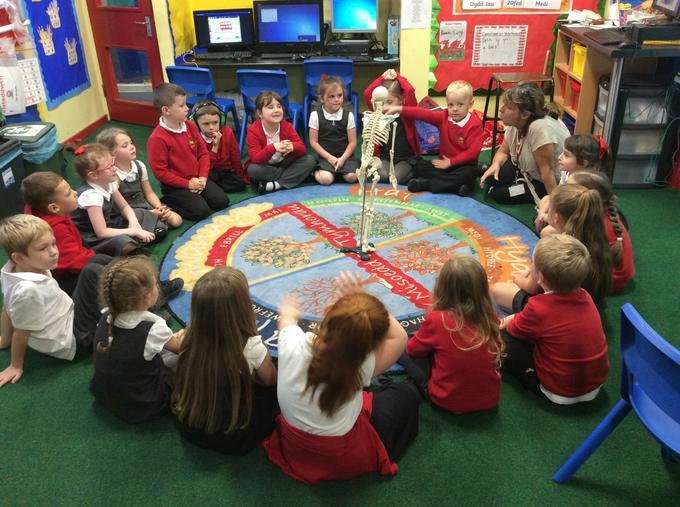 We have also been learning about parts of the body which is all linked to our dinosaur theme as we have been learning all about a dinosaur skeleton too! PE will be on Thursday, children are to bring their kits in with them and change in school. If easier the PE kits can be left in school for the term. Reading books should be brought in to school in a book bag every day. Homework will be given on a Friday to be returned by the following week. Spellings will be given every Monday to be learnt by the Friday when we will have our weekly spelling tests. Fruit money can be payed weekly (£1) or daily (20p), please bring in an envelope. Children will then receive a piece of fresh fruit and a carton of milk everyday.